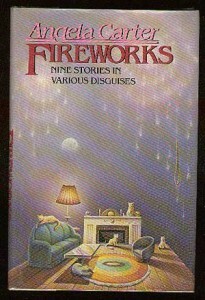 Fireworks: Nine Stories in Various Disguises, Angela Carter, Harper & Row, 1974, ISBN 0-06-014852-7, $9.95, 133pp. “A Souvenir of Japan”–A study of everyday alien-ness, how a Western woman and a Japanese man can find each other appealing, yet still know nothing about each other. Carter captures the disillusionment fairly well, but it never really coalesces into a Story. “The Executioner’s Beautiful Daughter”–A disturbing look at a strange group of humans. This story recalled for me the phrase,”Who watches the watchmen?” Except here, the phrase should read who punishes the punishers. “The Loves of Lady Purple”–An interesting grotesque about an old puppeteer and his special marionette, the Lady Purple. The language is beautiful, although the meaning is hidden. “The Smile of Winter”–If a story could be a painting, this one would be on hanging on the wall. As such, I found it interesting but boring. “Penetrating to the Heart of the Forest”–Carter is remembered best for her retelling of ancient tales, mostly fairy ones, but here she shows that she can also delve into the mythology of the bible for her reinventments. Her lush language fits this forest, and the ease at which the story shifts from point to point is simple yet masterly. “Flesh and the Mirror””–An interesting character study of a woman who returns to Japan and finds her lover less what she had made of him while she was gone. The psychological dissection was intriguing, but there was no story to pin it on, and again, I found myself adrift. This is the second story of a woman in Japan; had Carter also spent time in Japan? “Master”–A bit of the heart of darkness from the native viewpoint. Either that or a really perverse retelling of Robinson Crusoe. Again, interesting, but I do not seem to be catching the point of these tales. “Reflections””–Wooo, what a ride, almost surreal in its depiction of the world in the mirror. Not quite what I was looking for, but closer. “Elegy for a Freelance”–The idea, I believe, is to go on about the details of life while something is happening in the greater world that is more important. These characters can not see the forest for they are the trees.